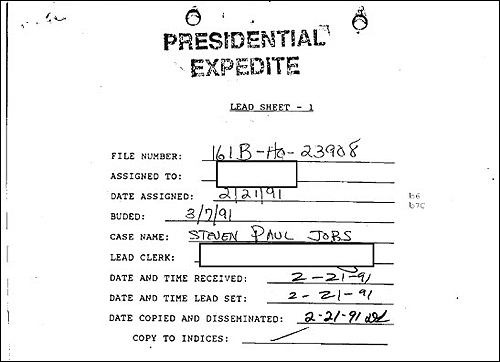 The Federal Bureau of Investigation released a background check report on Steve Jobs from 1991 when Jobs was being considered for a position in George H.W. Bush’s administration. Aside from a few comments about “his personal life being lacking due to his narcissism and shallowness,” there were not a whole lot of surprises in the 191 pages, other than the fact that he did some drugs in the 1970s (who didn’t? ), he was neglecting his daughter born out of wedlock and was involved in a few lawsuits. What may be surprising to some folks is the degree to which the FBI used “open sources,” or public records, in the course of the investigation. While the FBI did access sources only available to law enforcement officials (i.e., NCIC), the majority of the report is filled with public record checks, including checks of civil and criminal indices, verification of high school and college degrees, review and analysis of court documents, and interviews. Today a background check of this depth and nature by a private investigative firm would cost upwards of several hundred thousand dollars, but it can be done. Questionnaire – Jobs filled out a 12-page questionnaire, providing his address history, school history, detailed employment history, familial history, “police record,” litigation history and medical record, among other things. If you are hiring an executive for your company or a board member or even considering making an investment with someone, why not ask the person to fill out a background check questionnaire? Asking someone to fill out a medical record questionnaire is completely off-limits due to privacy restrictions, but asking some basic questions may not be. Signed Release – People watch too much TV and think that the FBI has a dossier on everyone and can instantaneously access everything about you. They can’t. Even the Federal Bureau of Investigation required a signed release from Jobs to access information about him, including his credit report. Review Court Records – In addition to retrieving and reviewing litigation that Jobs disclosed on the questionnaire, the FBI reviewed and retrieved civil and criminal indices in the counties and states where Jobs had resided. The report indicates that they checked records at the courthouses in the California counties of Santa Clara and San Mateo, where Jobs lived. As we have previously discussed on this site, even in the digital age, going straight to the courts is the single most important thing you can possibly do to find civil lawsuits and criminal records. Interviews, Interviews, Interviews – Although public records can provide an enormous amount of detail about a person’s past, “human intelligence” can provide some information that you may not get elsewhere. Through the more than 15 interviews with former business associates, employees and other persons knowledgeable about Jobs, they found that he “experimented with various drugs” and was “strong willed, stubborn, hardworking and driven, which they believe is why he’s so successful.” One thing you will notice: The FBI didn’t interview “references” that he provided; they went out and sought independent references. Financial Means – One focus of the FBI’s inquiry was to determine if Jobs “lives within his financial means.” As we have pointed out at various times on this site, living beyond one’s means is a major red flag of potential illegal activity. While the FBI conducted interviews to determine Jobs’ financial means, you can also check public sources to identify houses, boats and cars or social media to identify expensive jewelry, vacations or art. Fill in the Blanks – Another focus of the FBI was to “account for” the last ten years of Jobs’ life. Understanding where the person lived and worked and what he did for any given period of time can find holes, inconsistencies and misrepresentations that need to be vetted. For example, if a previous employer is missing, where was he employed? If there is a gap in address history, where did he live? These questions can lead to employers that fell off of a resume for a good reason or even disclose a stint in a mental institution or jail. So how do you conduct a background check like the FBI does? All you need is several hundred thousand dollars. Bank account and routing number available upon request…. It’s cool to look at the actual lead sheet on Jobs. Very interesting and well-written piece (as always!) about how much we can do ourselves. Thanks. Most people don’t realize how much information is out there. The key is understanding where to find it.